Take care of your newly planted trees and you’ll see them grow big and strong! Spring is here and newly planted trees are popping up in yards and commercial landscapes throughout the state. While these gorgeous new signs of spring are a fun way to bring in the season, they need proper care to turn into full-fledged energy-saving trees in the future. Here are some of the best ways to care for your newly planted trees this spring. 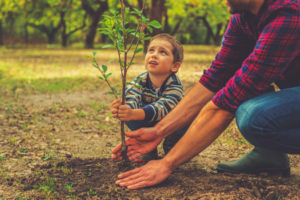 Newly planted trees are under a great deal of stress since they were taken from their previous environment and soil and planted into a totally new place. They need extra TLC, so ensure that you are properly watering them to get moisture to the new roots. Throughout the first two weeks of your newly planted trees, water them deeply every day. For the first year, water newly planted trees once a week. During hot and dry periods, like the upcoming summer, take the time to water more frequently. Mulch is ideal for helping newly planted trees keep moisture for proper soil temperature and root growth. Don’t put on too much mulch or use the volcano mulching technique, as this can attract fungi and pests that will destroy your newly planted tree. Instead, use organic mulch and apply it in 2-4 inch depths around the drip zone (the area where the tree’s leaves grow out). Pruning is important for established trees but not necessary for newly-planted trees just starting to adjust. Trim away minor defects or issues immediately, but hold off on a full pruning until it’s been at least a year. If you trim too soon, you will limit your newly planted tree’s ability to grow and flourish. This entry was posted on Friday, April 7th, 2017 at 12:38 pm. Both comments and pings are currently closed.